Earth Girl is a bold and unique novel that is easy to get powered on. From its remarkable cover, touching and thought-provoking, to it's flavorful cast of characters I have no doubt that Janet Edwards will catch a wide variety of readers. Jarra is a heroine with such a passionate voice, one that makes me sit up and pay attention, especially since she speaks directly to us, the audience. Reading her words as though they were written just for me made me shake my head in amusement, pocket a tissue for tears and focus intently on her hopes and hardships. In short, I've never felt so bonded to a character that I felt every bit of sympathy imaginable for her. It literally took me days to stop talking, or even thinking, about Jarra's story. Under the layer of science-fiction and this highly advanced futuristic society, there's something very realistic about Earth Girl. Jarra has to deal with her being Handicapped and not knowing who her birth parents are. She struggles with making the decision to reach out for the parents who sent her to Earth, a place she's bound to because of her immune system that does not allow her to portal to other worlds. It's this aspect of the story that made Jarra become more than just a fictitious character. Edwards is a totally zan author who not only goes above and beyond expectations for an entertaining sci-fi novel, but she sets a whole new set of standards. She captures it all: romance, adventure, and intricate subplots that aid in creating a world unlike any I've read before. Even the characters' colloquial speech is lavished with a distinctive style. 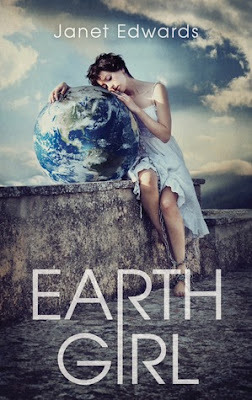 Earth Girl is a prime example of my gratefulness for the literary convention of a series; Edwards will sure as chaos continue to dazzle and delight with one of the most outstanding heroines of YA literature!